CHARLESTON, S.C. - Many are still trying to comprehend life in America where an act of murder occurs with deep racist motivation in a house of worship amid a growing climate of turmoil, mayhem and what can only be described as White domestic terror. Shock and alarm gripped Charleston and the country after Dylann Roof, a 21-year-old White male allegedly walked into Emanuel African Methodist Episcopalian Church—one of the oldest Black churches in the South—and sat through the Wednesday night Bible Study. He then pulled out a gun and subsequently unleashed a barrage of deadly bullets, reportedly reloading five times. When he finished, eight parishioners, including the prominent church pastor and State Senator Clementa C. Pinckney were dead. A ninth victim died from wounds at an area hospital. 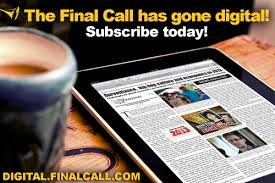 After an intense manhunt involving local, state and federal authorities, Mr. 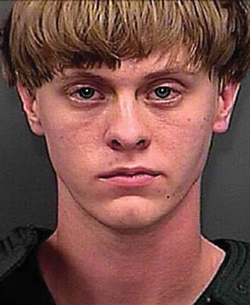 Roof was apprehended less than 24 hours later in North Carolina, returned to Charleston and charged with the killings. Mr. Roof is now in the Sheriff Cannon Detention Center, on a $1 million bond for weapons charges and is expected to be back in court in August where the bond will set for nine counts of murder. “Black people still have a tendency to think that everything will be okay; that everything is still peaceful with us among White people. 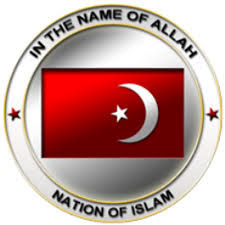 But in the midst of this you also have a class of people that’s tired … frustrated … fed up,” explained DeAndre Muhammad, Charleston representative for the Nation of Islam. 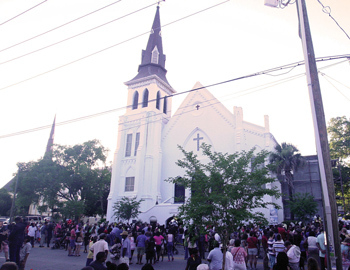 On Sunday, June 21, Emanuel AME Church opened its doors as a signal that the act of terror on its space and parishioners would not stop the spiritual calling and historical legacy the church has. Thousands stood in the blazing sun and lined the street outside the sprawling church as the sanctuary was filled to capacity as were the lower level rooms where the bloodshed happened. Supporters from around the United States and Canada, fellow Christians, Jews and Muslims from the Central Mosque of Charleston attended in a show of interfaith support. Friends and family shared their gratitude in the midst of their pain with The Final Call for the outpouring of condolences and concern. 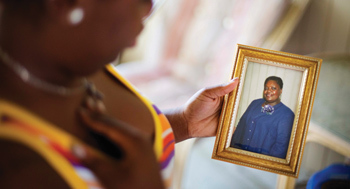 Sherrell Nelson lost her 87-year-old aunt Susie Jackson and 26-year-old cousin Tywanza Sanders. “It’s overwhelming to see the outpouring of love with all the flowers and tributes,” she said. Patricia Jones either worked with or went to school with at least four of the victims, saying she was “saddened by the whole thing” that rocked the tight knit church community. The shooting happened at the church Denmark Vesey co-founded in 1818 that historically was a hub for liberation and organizing for self-determination, a cause that freeman Vesey lived, fought and was hanged for in 1822 along with 35 others. The church was dedicated to an anti-slavery agenda, and at one point was burned down by proponents of White terror, oppression and slavery. Now the question of racial terror comes front and center again, at a time when people have been resisting injustice in the wake of police and vigilante killings of Blacks. The cases of Trayvon Martin, Michael Brown, Eric Garner, Renisha McBride, Tamir Rice and the brutal murder of Walter Scott, coldly shot in the back by now jailed former North Charleston police officer Michael Slager are among the most often cited. There are concerns about a spate of Black men found hanging from trees in recent times, raising the reminder of America’s history of “terror lynching” where Black people were tortured, maimed, beat, burned to death and suffered slow, agonizing hanging deaths. 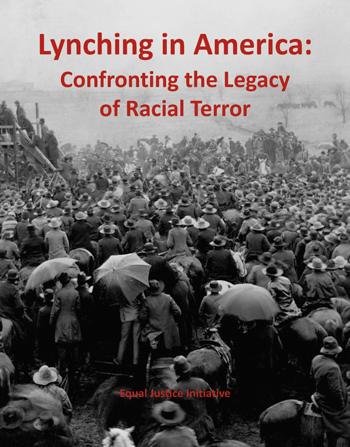 A report from the Birmingham, Ala.-based Equal Justice Initiative called “Lynching in America: Confronting the Legacy of Racial Terror” revealed between the American Civil War and World War II, Blacks were lynched regularly in the United States and an estimated nearly 5,000 men, women and children were lynching victims. 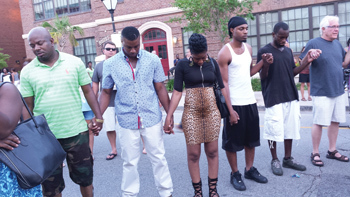 Between the 1990s to as recent as April 2015, Lennon Lacy, Otis Byrd, Roosevelt Champion III, Fredrick Jermaine Carter; Anthony Hill; James Byrd; Brandon McClelland and Andre Jones were Black men who experienced hideous deaths either by hanging from a tree, hanging in a jail cell or the horrific dragging of bodies chained behind pickup trucks. 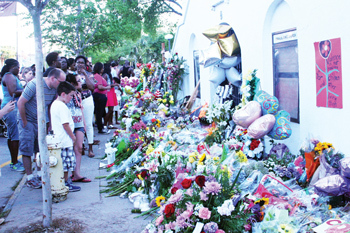 “We need to be clear, this is not an aberrational event,” said Cornell William Brooks, president and CEO of the National Association for the Advancement of Colored People to The Final Call after the first Sunday church service at Emanuel AME after the June 17 attack. Mr. Brooks believes there is a national resolve to move forward and “be tragically inspired by this to prevent future tragedies from happening” but cautioned underlying racism and that the shooter was fueled by White nationalism must be addressed. To “blink that or ignore that, ignores the tragedy, he said. According to the Bureau of Justice Statistics data obtained from interviews with victims, the number of hate crimes has remained fairly constant over the past decade between an astronomical 200,000 and 300,000 per year. 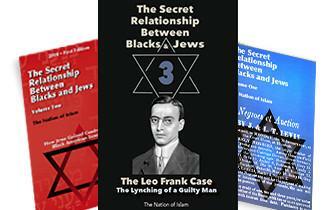 Their statistics reveal the vast majority are perpetrated against Blacks. Van Jones, political commentator and environmental advocate, told The Final Call he sees a double standard in how the shooter is being handled in comparison to how other communities are handled. Every time a Muslim does something crazy, every Muslim leader has to come out and explain, he said. If Black youth “riot” in Baltimore—every Black leader is expected to apologize and explain, he added. In contrast, he said, when White bikers shoot themselves up; nobody calls them thugs or talk about White on White crime. “White 20-year-old males continue to pull off massacre after massacre and nobody is asking where their fathers are and no White leaders are being asked to explain themselves,” he said. “You cannot overcome a demon until you face that demon,” said Mr. Jones. Many leaders refuse to face the demon of racism and it festered to the point of catastrophe at the church, he said. “At some point you have to have leaders—and I mean White leaders—who are willing to say we have a problem and ask tough questions of the White community. What are we doing behind our closed doors that leads to our children coming out to do such things?” asked Mr. Jones. Malik Zulu Shabazz of Black Lawyers for Justice said to move forward and change things there must be a “stirring of the pot” against what he called a conspiracy to keep White supremacy in control of Black people. There is “collaboration between the power structure and a certain class of Blacks who have agreed to cooperate with the power structure,” he said. There is a strong grip on the local clergy in South Carolina that must be broken, the lawyer said. 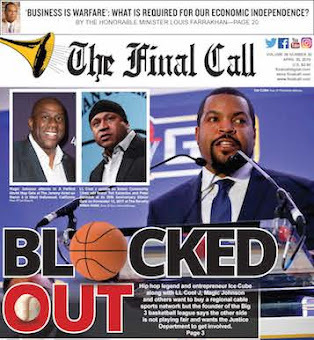 They are dedicated to keeping the Black population “quiet and obedient” and the people need a lifeline they can’t get from local leadership that has “cut a dirty deal with the devil,” Attorney Shabazz charged. Meanwhile White domestic terrorism, whether in the form of bullets from police guns or massacres as in Charleston, S.C., America and the Black and Brown victims of the domestic terrorism has reached a juncture of history for Justice … Or Else! 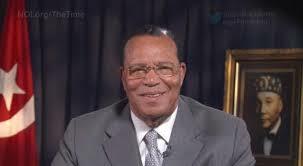 “The Honorable Elijah Muhammad said God is going to force the enemy to treat you worse and worse by the day! Every day he is going to treat you more and more evil! 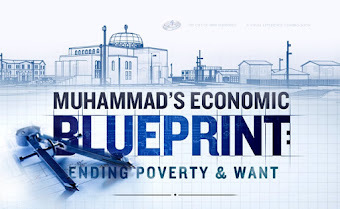 So don’t think you’ve run out of hearing about ‘Black suffering’ and ‘Black death and slaughter’—oh, no … It’s going to increase! Increase for what? 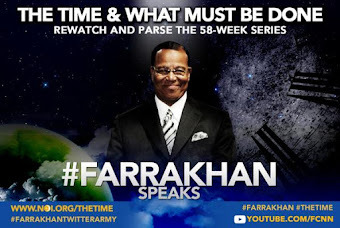 So that your ‘agreement with hell,’ as Isaiah the Prophet says, ‘will not stand.’ You’ll have to come away from your 400-year-old enemy, and build a nation of your own, or suffer the consequences,” said the Honorable Minister Louis Farrakhan in a June 20 FaceBook posting.